Internet Scammers: Are You A Weena? The movie was about a person who travelled through time, The Fourth Dimension, and came upon a future race of childlike humans called the Eloi who were eaten by the humanoid creatures called the Morlocks. Weena was an Eloi in the movie. The Eloi became a complacent society. 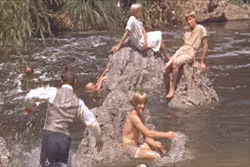 When the time traveler first met them, Weena was drowning in a stream as the other Eloi sat and did nothing. The Eloi allowed themselves to be eaten by the Morlocks without a fuss. Today most internet (The Fourth Dimension) victims (Eloi) allow themselves to be swindled by the scammers (Morlocks). A pejorative term used to describe a person who is unsophisticated and overearnest. Don't just sit, get eaten or drown, stand and and fight as the time traveler did. Just as in the movie, light is the enemy of the scammers.